Gun Digest. Just enter your e-mail in the box below. You’ll also be signed up to receive free e-newsletters from Gun Digest and partners. If you’re looking for a good first concealed carry gun, you can’t go wrong with a Glock. If you’re not sure about that, just ask me and I’ll tell you. 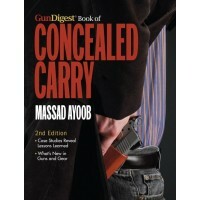 I’ve noticed a few things among those pondering a concealed carry gun. Maybe it’s just me. A co-worker sought my advice about choosing a concealed carry gun. It was time to get armed. Well, Glock Snob has noticed a few patterns that tend to surface when it comes to folks contemplating starting to carry a concealed handgun. As I wrote recently in this primer on buying your first concealed carry handgun, newbies tend to overlook the price of ammo. Stop fretting about stopping power and think what it will actually cost you to shoot your handgun. To be sufficiently prepared, you’ll need to practice frequently. Training is key. I almost always recommend a semi-automatic handgun as the primary CCW gun, and it doesn’t take long to blow through 500 rounds (expert tip: buy a Glock, and you won’t get any jams). You can drop a couple hundred bucks in an afternoon at the range very quickly. Consider that .45ACP ammo can be as much as 150% to (in some cases) almost twice the cost of similar types and quantities of 9mm ammo. And when you actually study self-defense uses of guns, you see that the mere presence of a gun by an armed citizen is often enough to immediately deter the threat — it changes the cost/benefit analysis for the would-be criminal before terminal ballistics ever become an issue. Don’t choose a tiny CCW gun just because you think it’ll be easier to hide under a t-shirt. There are many ways, and many special clothes for CCW that can conceal full size pistols. Big guns can be shot more accurately and are more forgiving on recoil. The worst — and perhaps most common — mistake made is by well-meaning boyfriends or husbands recommending a small snub nose .38 special revolver to their lady. These little pipsqueaks are cute, but they bark and buck like mad. Your woman won’t feel comfortable carrying a gun like this, so get her a full-sized handgun — something she can shoot comfortably. I’ve noticed more commonalities, but the main thing to remember when buying your first concealed carry handgun — the most important thing in the whole world — is that you make sure, darn sure, that you always, always, always be sure that you buy a Glock.